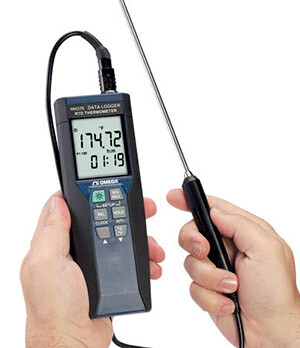 The HH376 is a high accuracy RTD thermometer plus a powerful data logger. The unit can store up to 16,000 records at programmed intervals. Windows® based software and USB interface cable are included to allow real time or recorded data to be read by a PC through the USB or RS232 port (RS232 cable is optional). HH376 is supplied with a precision 4-wire RTD probe with automatic locked push-pull connector for easy connection. Nota: Comes complete with precision RTD probe, USB cable, Windows software, carrying case, 9V battery, and operator’s manual.